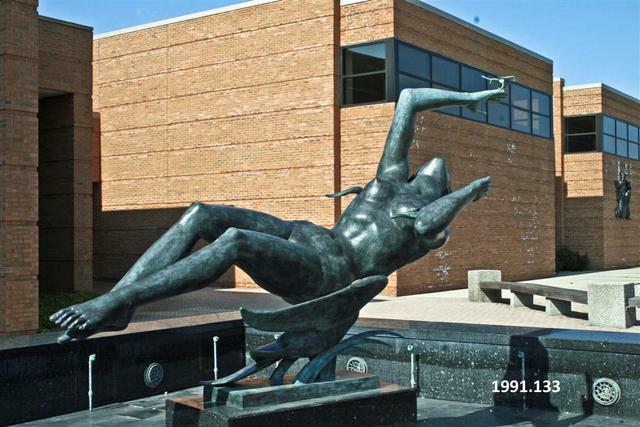 The Night and Day Fountain was commissioned for the Henry J. McMorran Auditorium in Port Huron, Michigan. Fredericks also created a gold anodized aluminum Sculptured Clock on the building that was completed two years before the fountain's installation. The sculptures and clock were conceived as a unified design concept. In keeping with a long tradition in western art, the sculptor personified time with figures representing night and day. Night has long, smooth, graceful curves that are repeated in the lines of the swan in flight beneath her. In comparison, Day is more angular and his muscles are more pronounced, as are the veins in the arms and hands. Day rests upon an otter, hunting in a school of Northern pike and Night floats upon a swan in flight, holding a small bird in her hand. The Night and Day Fountain can also be seen in the Sculpture Garden. 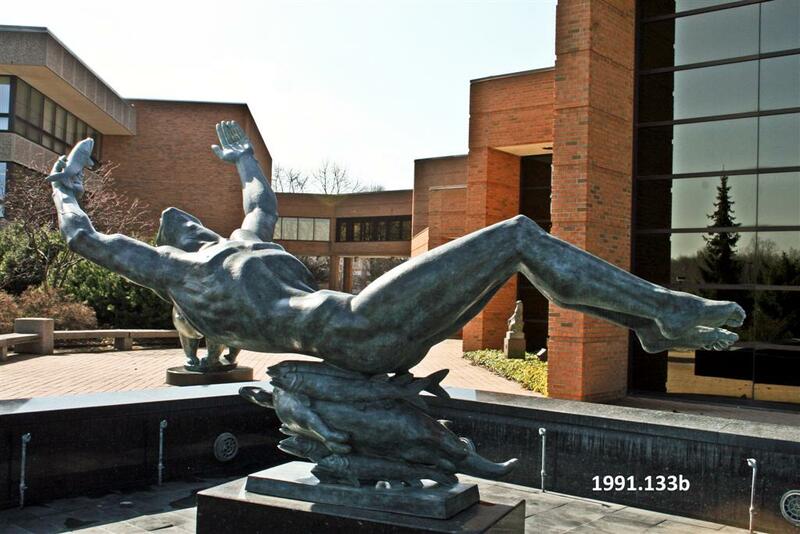 An image of the clock and sculptures can be seen on page 141 of Marshall M. Fredericks, Sculptor. The male figure is laying on his back with his arms extended. He is resting on a school of fish and a turtle. He holds a fish in one hand. The female figure is also reclining. Here arms are held above her head. She is supported by a large bird and has a bird perched on her hand. 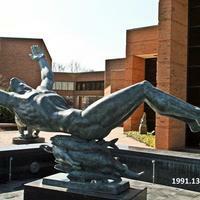 Fredericks, Marshall M., 1908-1998, “Night and Day Fountain [Bronze],” Marshall M. Fredericks Sculpture Museum, accessed April 21, 2019, http://omeka.svsu.edu/items/show/5173.